As it is commonly known, rechargeable batteries are environment-friendly as they save the costly materials which are used for their production. As the rechargeable batteries can be charged 1000 times, each such battery saves resources which would be spent on 1000 single-use batteries, thus spending less natural resources and saving environment form contamination. 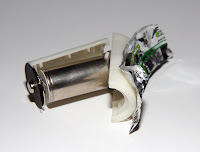 However the rechargeable NiMH batteries are not quite popular, because of the impression that they last less than their single-use counterparts. This question was recently explored by the author of http://www.newstarget.com/ Mike Adams. After sharing views with several people, he asked himself a question, whether battery companies produced less-quality rechargeable batteries to encourage the sale of more profitable throw-away alkaline ones. To move forward in his research, Mr. Adams bought some rechargeable Energizer “D” batteries. (We remind you that Energizer Holdings is an American manufacturer of batteries with a market share of approximately 25%). To leave no place for skepticism, Adams chose the biggest electronics retailer of the USA, “Best Buy” as his shopping place. His choice was approved by the fact that the rechargeable Energizer of size “D” had the same power capacities as the single-use, much smaller “AA” batteries (2500 mAh). Mr. Adams was astonished, why energizer of size “D” were so weak. So he decided to put the purchased batteries apart and see what there was inside. What he found out was striking: inside the “D” size battery there was a much smaller “AA” battery, surrounded by a cheap plastic shell to look bigger. However, the “AA” battery shelled in plastic and filled with air is cost more than $12, while the Energizer real-“AA” battery with exactly the same capacities costs only $3. Indeed, the labels can often reveal the real qualities of the goods we are buying, despite the sizes, shapes, colours and advertisements placed on the goods itself, as well as on the packages, on the shop windows, on the bill-boards, and other ports used for advertising. What a great this battery producers cheat I love this.